Looking around my house, it occurs to me that I have a lot of work I'd like to have done. The roof should be replaced soon, the furnace is getting old and the heat exchanger looks pretty rusty. ([Later it was discovered the heat exchanger had a fist-sized hole in it]. I'm overdue for painting and floor refinishing, and I'd love to replace that ugly aluminum siding. The kitchen counter needed some work, too. And I'd like to finish out my attic. I put a floor and pull down stairs in the previous year , but I'd like to make it a real finished space. Looked like it was time for some major work- maybe $20,000 worth. Gary and I got together again and started exchanging ideas, based on other buildings we'd seen and the kinds of functional addition I wanted. I've always liked the old farmhouse style, Craftsman bungalows, and classic details, like gable end returns. Gary is a big fan of Japanese style and joinery, something that strongly influenced Craftsman style. We both like the kind of modern interpretation of Craftsman style that fills the pages of Fine Homebuilding magazine. Gary's idea was to raise the ridge line and move it back. The front aspect would be similar to the existing house, and the rear would go up a story. I had been sketching a lot of ideas, and ended up with a farmhouse style, building up the right-hand side, under the small gable, and leaving the left side as-is. Both good ideas, but neither one of us could figure out where to put the staircase. We decided to bring an architect in on the project- something we'd have to do eventually for the engineering studies. The first architect we talked to didn't seem to want to divulge any ideas until he had a stiff retainer in hand, and what he did show us of his work wasn't too impressive. The second architect essentially told us he was far too busy to get to it in the next few months. I then remembered and architect I met playing in a band four years earlier, Ron Ellman of Ron Ellman Associates. Ron said he'd never worked on a house that small, but he was interested. He took ideas from Gary's and my sketches, and after a number of design iterations came up with something everyone liked. The idea was to create more room while at the same time making sure the house fit in to the neighborhood. Ideally I wanted something that looked as if it might have been built at the turn of the century. Originally the design called for two bedrooms upstairs, but then Gary pointed out if I left out a wall I'd have a huge room upstairs that could easily later be walled off to create a bedroom if needed. We all agreed that this was a great idea. The large open space would be my music and photo studio, and the basement area I'd been using for this purpose could become a large woodshop. Gary then took the design and worked with Ron, the engineer who spec'd the foundation and structural elements, and the truss company to simplify some of the structure specified by the engineer. I rented a storage locker and moved furniture, unused clothing and other material out of the house. I emptied the attic as well, and cleared much of the basement, storing a lot of posessions under plastic. I also purchased about $200 worth of plastic storage bins over three or four months. 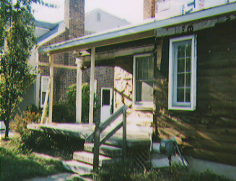 Finally, in the late summer, we were ready to begin work- once the permit was approved. 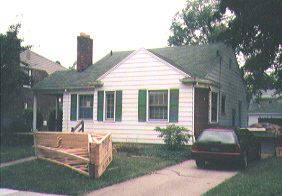 Since the addition was more than 50% of existing space, we had to go before the city planning commission for approval. Gary worked with the City Manager, who asked the commission for a special meeting so we wouldn't have to wait a month for the next scheduled meeting. They agreed (one of the great benefits of living in a small town) and after a brief discussion approved the plans with some nice words about the design., and how they thought it would add to the neighborhood. I decided to document the project at this point, and to that end I left a compact auto 35 mm camera on site where Gary could use it do document interesting parts of the project for this page. I'm also doing a series on 35 mm transparencies as well as shooting a lot of Polaroids when we need a quick reference. The collection will be useful in the future should I need to tear into a wall or floor. 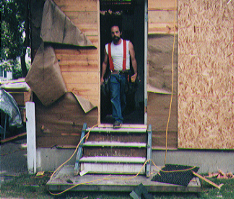 Most of the lumber is on site, including all the engineered roof trusses (on the lawn) and other special engineered products, and Gary and his partner John Bruno began demolishing the basement stairs and building the new stairs. They also sawed out part of the basement floor to pour concrete pads to carry part of the load of the second floor addition. 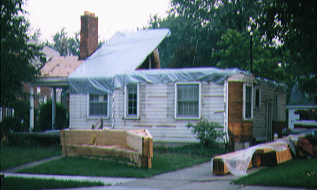 Note the tarps. Late summer and fall weather in Michigan involves a lot of rain! On the right side of the house you can see the wood sheathing- 1" ship-lap pine. 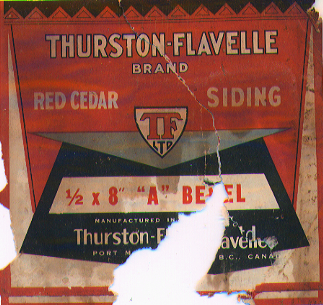 In front you can now see the original cedar clapboards that were under the aluminum. Everything is in great shape for a 60 year old house, except for some areas where water was trapped under aluminum trim. On the driveway are stacked the 32 foot 16" TJI structural beams. That's Gary exiting what used to be the main bedroom and will become the new entrance/mud room/breakfast nook. 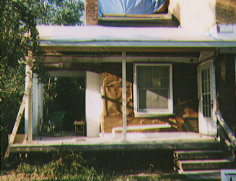 The steps were originally part of my basement stairs, and the platform used to be a neighbor's front porch. We try to salvage a lot. 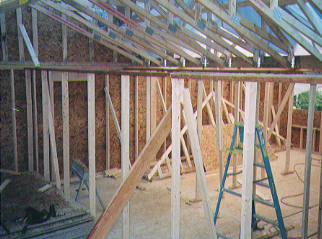 For instance, the old rafters became temporary walls while the roof trusses were going up and blocking to support the old 2x6 ceiling joists. Gary and John and a crew began building the new floor. The existing ceiling is 2x6 beams on 16" centers, not really sufficient to support the new second story. The new floor is built from 16" TJIs, a sort of engineered wood I-beam. Load will be carried by the walls and a 4x4 wood column in the center of the house that rests on a new steel column in the basement that itself rests on a new 3'x3' concrete pad. By week's end the new floor is in, most of the exterior walls have been built and sheathed and half the roof trusses are in. 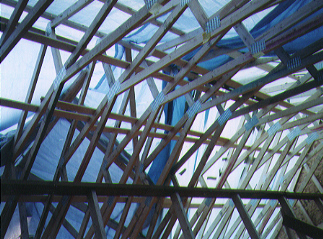 The old roof rafters have been salvaged for use as blocking, temporary supports and other uses. Climbing a ladder to the second floor I get a feeling of how big and spacious the new areas will be- especially with the 11' cathedral ceilings under the roof trusses. Wouldn't it be neat to just have a translucent roof overhead? Here's another view upstairs. The wall is a temporary support. Insulation contractor arrives and blows cellulose into the first floor walls. This week work is interrupted a lot by rain, but by week's end Gary and crew have finished all the roof framing and sheathing. I've been doing a few errands to save time and money, like buying the skylights and looking at shingles. Notice that Gary and John have started the shed roof that will extend across the front and over the porch. We also made the final siding and nearly final trim decisions this week. 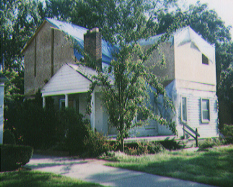 My original options were vinyl (cheap, but ugly), fiber-cement siding (cheap, rugged, looks good, difficult to cut) and cedar shingles. 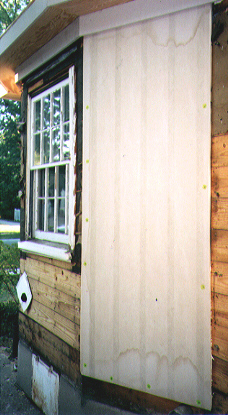 We decided to go for panelized cedar shingles (see http://www.cedar-valley.com) and painted trim. The look will be sort of American Shingle-Queen Anne-Bungalow-farmhouse. Gary and I also finalized a location for a small upstairs laundry where I can fit a compact vertical washer-drier. We still have some major decisions to make, involving the bathroom, lighting and the rear deck, but these can be put off for a while. The plumber should arrive the middle of next week to start work. We're thinking of having the new electrical drop buried- which would add $1,000 to the cost of the project. I'm learning that all changes, whatever the size or complexity, add $1,000 to the cost. (Gary tells me that adopting this rule will also cost $1,000, plus 10% overhead). Brief Sunday meeting to discuss the next week's plans and to inform me that the chimney needs some major repair and has to be extended a few feet, all of which will add about $2,000 to the project. There goes the salary bonus....;-) We also decided to do minimum changes to the basement laundry room, just moving the sink and machines out of the way of the stairs. This would save about $600 I'd otherwise have to spend to have a new drain put in under the floor. Gary is off for three days attending to another site, and I will be rearranging the basement to give the plumbers access to where they'd like to run the new plumbing. I'll also be pulling nails from the wood upstairs that was used for temporary supports. This might also be a good time to patch some old cracks in the basement wall. I'm also starting to think about specific interior trim and paint details. It will be quite a few months before any of this goes up, but we'd like to get some idea of material estimates so we can shop around for good wood deals. Gary returns to work on the shed roof and stairs and to supervise the subs. The plumbers and the heating contractor have been in and out and I've been doing some rearranging of the basement to accommodate them. Gary and John have finished the shed roof that extends out over the porch. The supports shown are temporary 4x4s that will be replaced by nice columns once the inspector signs off on the framing. Last exterior framing remaining: Gable end returns. Labor day. Everyone takes a break and I practice my demolition technique. I removed the trim from the kitchen window and the front dining room window. I'll do the rest next weekend since the new windows won't be going in until next week. This will give me a chance to think of some sort of temporary window covering since the mini-blinds are coming down with the old trim. I called Detroit Edison and got a human after only 45 minutes on hold. She took my name and said I would be contacted regarding moving my power line underground. To their credit they do have a very useful web site that answered almost all my questions. I thought I'd dig the trench myself, or hire kids to do it, but John says it's not too expensive to have Edison contract it. We'll see when they make their site visit. Gary and John framed the gable end returns on the driveway side of the house; this is starting to look like a very expensive architectural detail, but I think it'll be worth it for what it adds to the look of the house. The electrician, also named Gary, showed up for a site visit, and he and I went over some changes to the architect's drawings, which included changing the lighting plan, running power to the laundry, moving a data/phone jack, and adding a pair of rain proof outdoor cable pulling boxes where I can run things like antenna coax and satellite dish coax and power. My homework last night was pulling all the nails from the stack of 2x4s (and one old 2x6) upstairs that had been part of the temporary walls supporting the roof trusses. For some reason I enjoy this; it's relaxing while at the same time decent exercise. I pulled enough nails to fill my nail bag and ended up with a nice stack of wood ready to use again. Much cheaper than having trained carpenters do this, or throwing them out and buying more. Tomorrow I'll clear some space for the heating contractor to run the new supply and return trunks alongside the steel beam that spans the basement. Gary and John finished building the gable end returns and attached all but one, as well as more of the trim. They also put up a few pieces of the rigid polyurethane foam. I temporarily rerouted a phone line that was going to be in the way of the new cold air return trunk and did some more demo or plaster and wood to make room for the new trunks. There's a power out that should be moved, but I didn't feel like working on live circuits at 10pm. The trunks and the beam will create a low area (about 6' clearance) that will divide the basement in half; I may put a wall there. It also looks like ripping out the old bar would be a good idea, once the upstairs is done. Might be a good idea to rip out all the old walls (which are just pine paneling and a few studs) and rearrange things for better storage and work areas. The windows arrive today, but I don't have the garage cleared out yet. We'll put them in the yard and cover them with tarps for the moment. (The windows didn't arrive. The supplier called at 3pm, but Gary told them to deliver Monday). Detroit Edison dropped by and left a price sheet. Looks like it'll cost...yes, $1,000. But for that we think we can bury not only the power drop but the telephone line and the TCI cable. I don't subscribe to the cable TV service, but I might subscribe to @Home's data service. I did some more demo and cleanup over the weekend and cleared space in the garage for the windows, which arrived today. Yesterday was our neighborhood's annual block party and barbecue, and I spent a lot of time describing the project to interested neighbors. Last night it rained pretty heavily, but not heavily enough to get me out of bed to check for leaks. This morning I didn't see any obvious plaster damage. 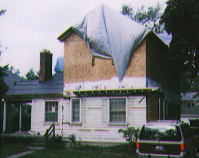 (The damage showed up later, as the entire living room ceiling started to flake paint) The NOAA forecast this week calls for mostly clear weather with a chance of showers on Wednesday, so work should proceed unaffected by weather. Looks like we're going to need another dumpster- somehow we've removed 75 cubic feet of trash! Gary and I finalized the shingle choice. We've passed rough inspection, plumbing and heat, I think; the floor can go on as soon as the electrician finishes up. Of course, first he has to start. Light rain. Hopefully it won't slow down work. We now have a mason, and I'm off to Michigan Masonry in Detroit this afternoon to buy 300 salvaged bricks @ 35 cents each for the chimney. That's only about $125; actually building the chimney will run about a thousand unplanned dollars. Ouch. That covers the mason, his assistant, mortar, time spent building scaffolding, etc. Note to self: Don't try to carry 1000lbs of bricks in a minivan again. 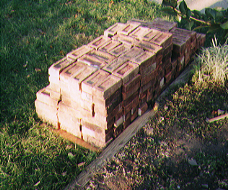 When I arrived the bricks were 45 cents each, and I was told that 35 cents was for commons, and Wyandotte Reds were 45. Fine. Except when I arrived home Gary told me the yard had quoted him 35 for the Reds. Hmm. I did learn a bit about bricks; Wyandotte is a community downriver from Detroit that once had scores of brick makers, until the good clay ran out and the labor became too expensive. My particular bricks were Clipperts, which the mason specified. Oh, and while I was off buying bricks in the van someone backed into my '94 Saturn wagon and dinged the bumper and quarter panel. John wrote down the license plate on a scrap of MDF trim. The prime coat makes a good writing surface. All the trim and vents under the eaves and gables will probably be done today. It's beginning to look more like a house. Gary and John have also begun putting up the rigid foam insulation board. 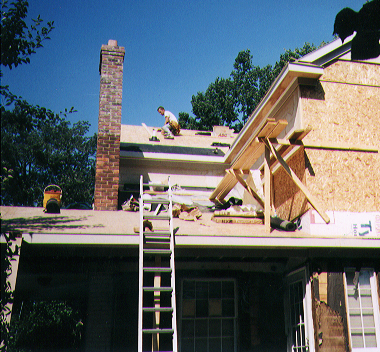 We talked a bit about doing cedar clapboards on the first floor and shingles above. There's a clear dividing line in the front, but it's not clear how we'd do the rear and sides. Last night I removed the trim from the old pull-down stairs- a few minutes work once I found a #1 Robertson bit for the cordless drill. That took an hour. Tonight it's cleanup time in the basement, tossing out the stringers that once held the ugly Celotex ceiling tile. The HVAC guy removed a lot of the stringers, and I'll remove the rest. Most of the Celotex came out some years ago when I replaced all the hot water plumbing, and I pulled the rest back in early August. If I do any finishing of the basement ceiling it'll just be painting the beams. The roofers are coming in next week, as is the mason, so Gary has to coordinate the two. It'll be much easier of the chimney can be done before the roof goes on where the mason needs to erect his scaffolding. The window sub is going to start work next week, doing a window here and there as he can squeeze in the time. Not a great day. A nail gun hanging above fell on John and split his lip. Gary dropped his Paslode Impulse nail gun and bent the nosepiece. I slit my finger open on some aluminum siding I was removing. Despite all this a lot was accomplished. Gary and John did a lot of trim, I removed a lot of old trim, and Gary framed the landing for the stairs. Gary's spoken with the guy who did the drywall next door- I had spoken with him briefly back in early August- and it looks like he'll be available. That's good, as drywall crew are in very short supply right now. There's a really neat renovation project on Washington Boulevard in Royal Oak about two miles from here that has had a huge sign in front saying DRYWALL CREW NEEDED for months. Gary and a sewn-up John started framing the skylights, and while Gary worked on the shower window framing and the stairs, John started nailing down the floor. I spent some time shuffling around stuff in the basement to make room for the electrician and the heating contractor. Gary and I talked about an idea of his for the bathroom. Instead of a level ceiling and a wall of glass block on the North wall, he suggested we slope the ceiling up, following the line of the trusses, and place a line of tempered glass windows at the top of the North wall, starting at 8 feet. This should really open up the bathroom, since the windows, being far above the stairwell, can be clear instead of obscured. This was not only inspired, it's cheaper than my original idea. It started raining last night and continued on sporadically through the morning. It's a light rain, and hopefully won't cause any problems. [I later realized I had left my latest photos, my notebook and my photo album out in the back yard!] I spoke with Rick, the painter, who won't be able to do the trim after all but will be available to do the indoor work later. On the plus side, the mason completed most of the chimney, Gary framed a number of interior walls, and four window units were installed in the Northwest corner. Standing in the corner of the house you can now get a sense of what a bright, open space it's going to be. We decided on clear glass for the bathroom awning window and the divider window, and considered sliding the laundry over a bit to widen the hallway, if moving the plumbing won't cost too much. Gary and the electrician decided to bring most of the wiring overhead rather than in the floor, so we can finish nailing the subfloor down this week. I'll bring a spool of RG-6 upstairs and we can run a line to each room. I'll do the first floor when the basement is clean and the electrician finishes. Joe picked up most of the aluminum scrap; I'd better call him and see if he plans to get the rest. Gary's off site most of today on another job, but he did call twice regarding some details, and he dropped the chimney liner in today while the mason's scaffolding was still up so the HVAC contractor can finish his installation. 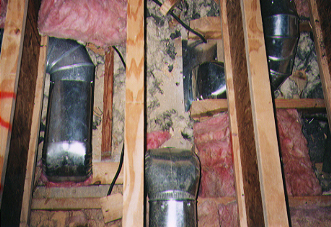 All the HVAC ducts have been run save for one going to the rear entrance/mudroom. The heater is connected to the flue, and was in fact running when I came home. The cost of moving the plumbing is only about $150, so that's a go. Looks like the stairs will go in tomorrow, perhaps finishing on Friday. And the chimney was finished, with a nice little corbel at the top instead of the plain cement cap that was there previously. That's a nice traditional detail- as is the 1999 penny the masons cemented in the cap. The roofers have been moved to next week. The shingle I'd selected- a blue-grey called "Wedgwood" is a special order, so I decided to go with my original choice, called "Antique Slate". The weather forecast calls for a chance of rain on Monday, so I'm keeping my fingers crossed. On the plus side it's been warming up, and will be in the 70s through the weekend, and may hit 80. I looked through some telecom catalogs and talked to a couple of our local network experts (Dan, Chris and Chuck) and decided to have all the telephone and data wiring terminate in RJ-45 connectors in the walls and in 110 punchdown blocks in the basement, on the North wall. I'll need two or three blocks, depending on how I organize the wiring. The Telco stuff can easily live on one block, since for now it'll all just be tied together with a jumper to the Telco NDI box. Upstairs I'll have 32 voice pairs and 32 data pairs, and on the first floor half that number. The basement will get lines added as needed, since there's no ceiling and no problem adding lines when I need them. For now I'll just punch in the existing two pairs from the hallway and library/guest room. I've ordered two blocks and I'm going to pickup a 110 punchdown tool at Home Depot. I finally made a police report on the car that hit my wagon, and the officer called later to tell me the woman who hit me admitted she did it. 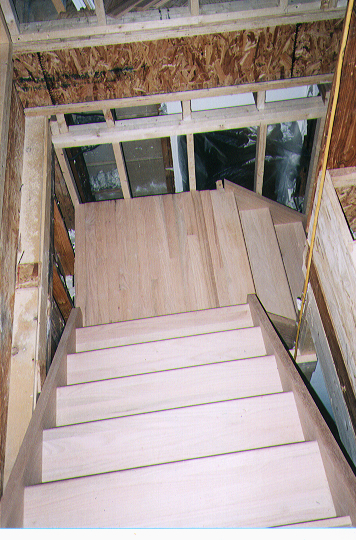 Gary and John installed the new oak stairs, and it looks great. I went to the Home Depot to get a roll of rosin paper and some masking tape to protect the stairs while the rest of the construction goes on. Didn't get home in time to put the paper down (no light upstairs, and it gets dark around 7:30) but I'll have all weekend to do it. All the interior framing (minus a few closet details) is done, the subfloors are down, and the roofing materials are on-site. Gary and I talked a bit more about storage over the entrance in the master bedroom; I think I'll ask him to just frame it, and I'll make cabinet doors later as a winter project. The roofers turned up unexpectedly, and luckily Gary drove by and found them at work. He hadn't intended to work today, but he put in a few hours coordinating the installation of the skylights. I covered the new oak staircase with rosin paper and, after a bike ride, a section of the first floor as well. I later did a little shopping for supplies, and found an RJ-45 crimper at the used tool store for $2.99. That's better than paying $35 for a cheap new one. I also found an old Stanley #7 plane for $40 at a flea market, so there go the savings. Windows: All on site; some installed. All exterior trim and most interior trim removed. Electrical: Just started. A few power and data lines pulled. Porch roof: 75% done. Needs columns and ceiling.